There's no place like the Pacific Northwest! We're celebrating our youngest members...all month long! April is Youth Financial Literacy Month, and we invite all our members (young and old) to help us celebrate the future of Qualstar…our Youth Account members. Branch events (with cookies, of course), matching deposits for new youth accounts opened, and a chance to WIN one of seven (7) Grand Prizes for helping us raise funds for local Boys & Girls Clubs. Get More YOUth Month Info HERE! If you are passionate about participating in the success of an organization, we invite you to submit an application to occupy a seat on Qualstar’s Board of Directors. 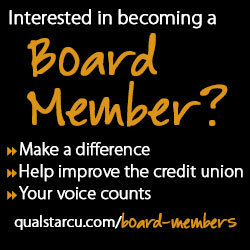 Qualstar’s Board is an integral component of helping our members achieve their financial goals and dreams.